May 2009 – Sandy N.
I started in 2000. I watched a project being done on Carol Duval; took a class and was totally hooked. I like creating backgrounds. My favorite is to take Distress Inks and cover a craft sheet; then spritz with water and take glossy cardstock which I have stamped with resist and swirl over the inks. I also love water coloring and the stampscapes technique. I would like to suggest that if you join a group, participate in that group. It is amazing how much it expands and stimulates your creativity. The serene beauty of Asian artwork beckons me. I would love to go out west to the stamp designers’ studios and see their artwork. Sweet Georgia Stampers and Saucy Sassy Stampers. Vamp Stamp News. Loved Rubber Stamper and Expressions. They are gone but not forgotten. Love to cook, knit, read, and play with polymer clay. I have done lots of crafts over the years but I have never enjoyed any craft as much as stamping. I never tire of it. I love any kind of challenge and taking classes whets my muse. None. My daddy was a Realist painter but I did not inherit that gene. I can’t even draw a straight line. Encaustic Wax, bottle caps, cookie cutters, drawer liners, coffee can sealers, buttons, dried flowers. Tim Holtz, Ranger, and Goggle will just about find anything. 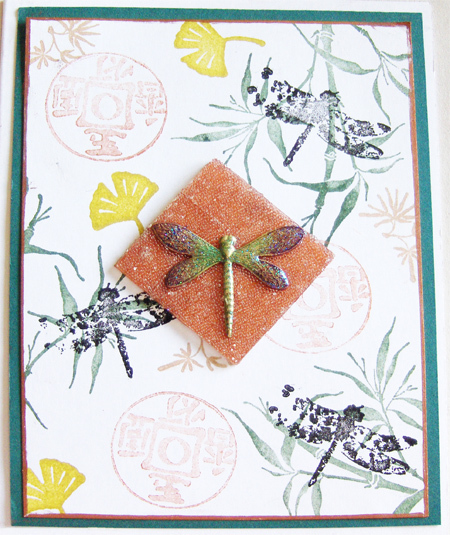 I also love to look at stampers’ blogs to see their artwork. My husband and I live in Locust Grove, Georgia (35 miles south of Atlanta) with our baby (a miniature Schnauzer named Chase) We have six children between us. My son lives in Boise Idaho. He has a 17-year-old son named Evan. My daughter lives in Mason Ohio and has a 5-year-old daughter named Grace. They are all my pride and joy. My husband has three girls, two live in Georgia and one lives in Alabama. He has six grandchildren and three great grandchildren so we have a big family. We have an RV so we do get to travel. My husband is a retired police sergeant (35 years) and I worked as a code enforcement officer (22) years for the same municipality. My husband is currently working on a craft room for me in his workshop. It is going to be fabulous. I have definitely outgrown this room I am in. 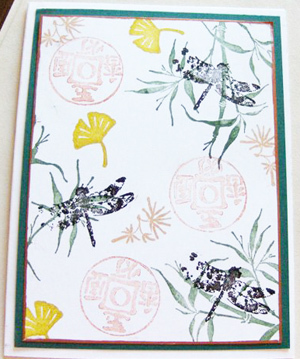 To create my collage card, start with the bamboo (largest stamp) inked with Ivy and stamped in three areas, then stamp with the coin (next largest stamp) inked with Copper, stamped in three areas. 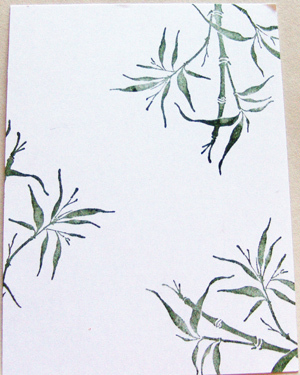 Fill in with the small ginkgo inked with Olive and the small flower inked with Beige. 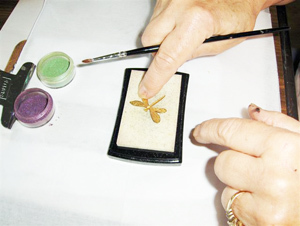 Stamp the dragonfly with Black in three areas. Edge the cardstock with the Copper Krylon Pen. Attach the green card stock to the white base card stock and then attach the collage cardstock to the green cardstock and set aside. 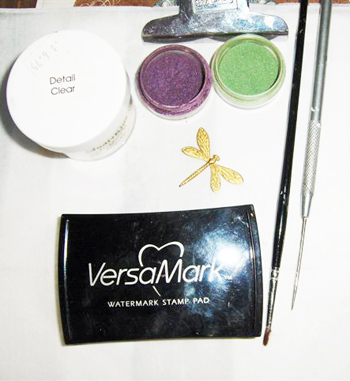 Assemble the charm, green and purple Perfect Pearls, Versa Mark, Clear and Mystic Rainbow Embossing Powder, spoon, brush and pick. Set the charm aside for the time being. Gather together your memory glass, sugar beads, clear embossing powder, copper Perfect Pearls, and Versa Mark. 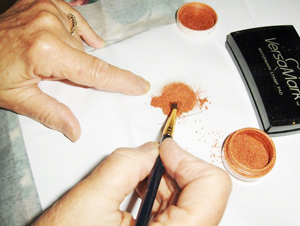 Press the memory glass into the Versa Mark ink pad then cover with a nice layer of copper Perfect Pearls. 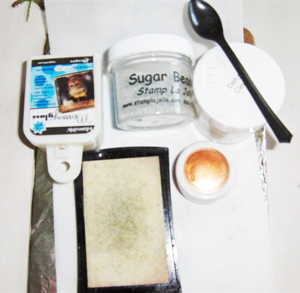 Heat the glass and cover with a layer of the clear embossing powder (remember start high so it doesn’t fly everywhere). I added another layer of clear embossing powder. Flip the glass over (make sure it’s clean) and cover with redline tape (preferably a sheet if you have it so there isn’t a line). Trim. 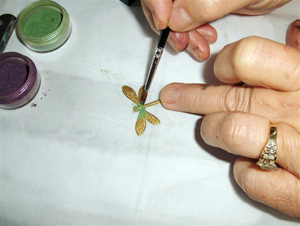 Remove the tape covering and place your dragonfly in the middle and then cover with the sugar beads. 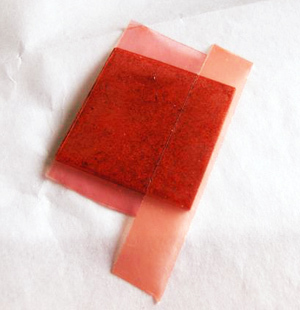 Place redline on the embossed side of the glass and attach to the card. 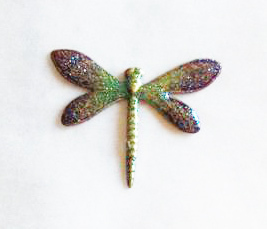 One Response to May 2009: Sandy N.
I have been looking back over the SAM’s since I became one and can’t believe no-one saw your wonderful dragonfly. I want to give this a try…it is so beautiful. Thanks for sharing your gorgeous project.